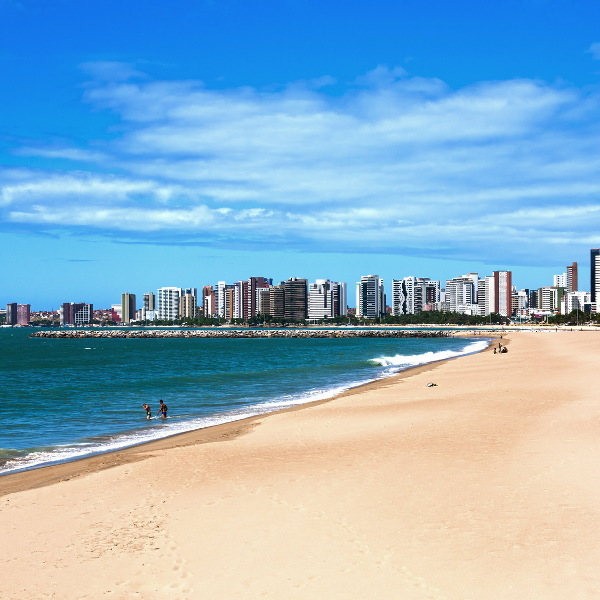 Fortaleza is the sunniest seaside city of Brazil. The 863,000 residents and visitors alike really know how to take advantage of the city’s picture-perfect coastline beaches. This city is world renowned for its all year sunshine, pristine coast, artisan ice-cream shops and delicious seafood! Much-loved tourist spots include Morro Branco, Praia de Cumbuco and Cachaca Museum. Cheap flights to Fortaleza are now available for a limited period of time, so get ready to be fascinated by this astounding city! Fortaleza is home to Pinto Martins – Fortaleza International Airport (FOR), which is located on a 23-minute drive from the city centre. These local fishing boats are part of what has made the city famous. 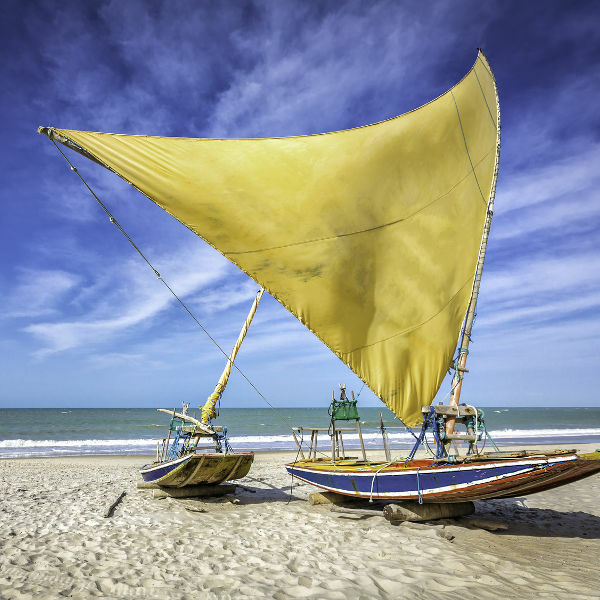 Take a ride on a Jangada boat for an authentic Brazilian experience. Visitors flock to this city for one thing– its beaches! 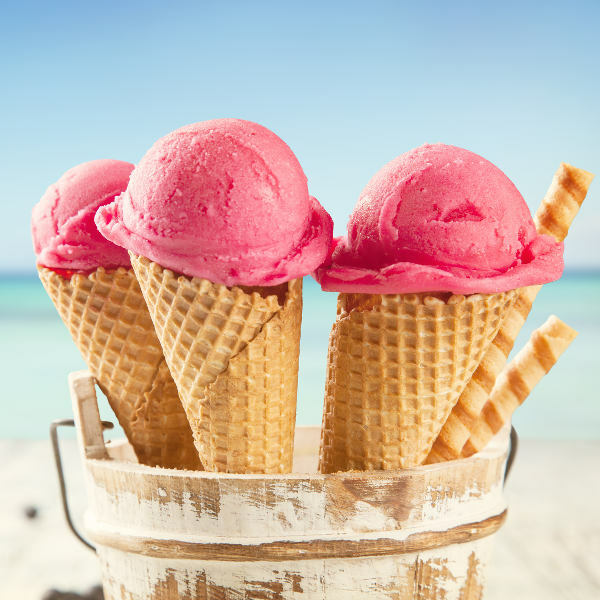 Go for a swim, take a stroll along Beira-Mar Avenue, and eat some ice-cream while enjoying the great weather. If there’s one city in Brazil where the sun’s always shining, it must be Fortaleza. Savour fantastic summery days all year long while you enjoy beaches, food and more. Fortaleza has a unique climate with warm, beach going temperatures all year long, and a rainy season that spans seven months. The rainy months are from January to June, but typically, it doesn’t rain for too long at a time, so it won’t keep you from enjoying your time out. With this type of weather, it would be great to visit Fortaleza all year long, but to avoid the summer and winter crowds, consider visiting during spring (September to November) or autumn (March to May). During this time, the city is less crowded: it is low season, so you will be able to find cheap flights and accommodation to Fortaleza. The local carnival of Fortaleza also brings mass crowds, and takes place during July each year. With all year sunshine and white sandy beaches, it’s no surprise Fortaleza is the holiday city of Brazil. You can expect visitors from all over the country and abroad enjoying the sun and taking dips in the Atlantic Ocean to cool down. Visit Praia do Futuro beach to work on your tan. Fortaleza is also famous for its delicious crab shacks, that you can find right on the beach promenade. After a day of swimming and eating some delicious seafood, head over to Praia de Iracema neighbourhood for an evening of fun. Practice your dance moves with some samba or “forro”. With roots based in Portuguese, Latin and African dance styles, you’re guaranteed to work up a sweat and have a great time. Compare several airlines, and book your cheap flights to Fortaleza online at Travelstart! The city of Fortaleza is as safe as any other big city across the world. There are, of course, some precautions to take when travelling around the city. These include: not walking around alone at night, keeping your personal belongings out of sight, and not flashing expensive items around for everyone to see.